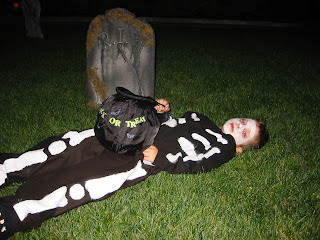 Preparations for Halloween started a few weeks ago. 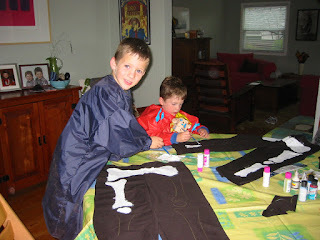 The boys were very specific about what they wanted to be, and how we should make the costumes. Somewhat disappointingly I was not able to get glow-in-the-dark paint (it's probably toxic). Adam helped me cut out the trousers, we bought the t-shirts from Old Navy. We had to paint the costumes in 2 sessions to allow the paint to dry. 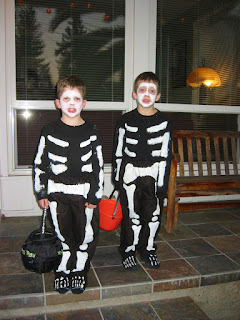 Not forgetting the skeleton feet. 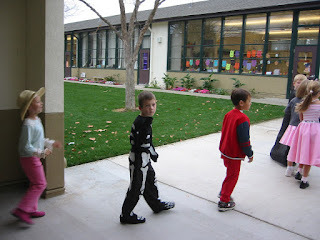 Halloween celebrations started at Adam's school with a parade and classroom party. Finally, we ended up at the top of the road when someone suggested that Finlay was the ideal complement to her decorations! We just experienced our biggest quake since we came to California. Reported by the USGS as a 5.6 we certainly noticed it! 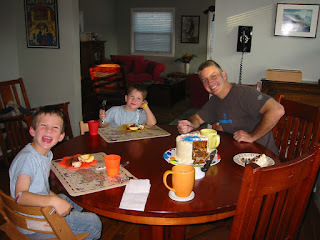 We were just sitting down to eat when the entire house started to sway rather severely. We could hear really loud creaks, but nothing even fell off the shelves. We went outside to check and the water in the pool was loudly sloshing about. 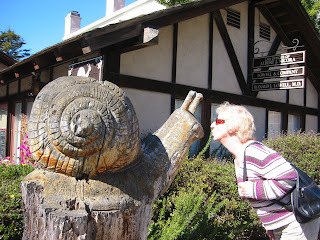 The quake seemed to last for ages, and we both felt rather queasy afterwards. It's amazing that the ground can move so much, yet the power didnt even flicker. 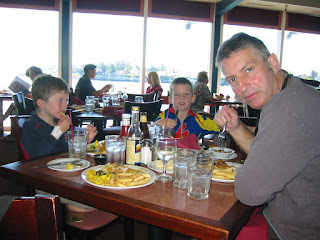 The movement was really quite strong to us, I can't imagine how a major quake would feel. Well, he's got it now! 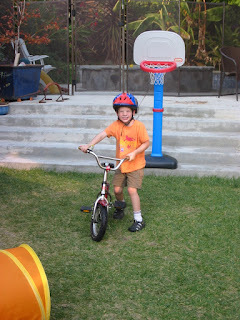 Finlay has been a cycling maniac since he mastered riding a 2-wheeler...he has ridden into town, not to mention the obstacle course that he has built in the back garden. We celebrated another birthday here at Ferretworld. 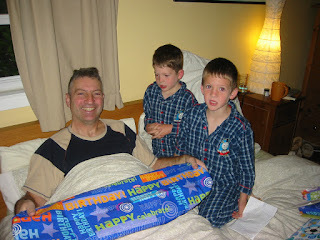 The boys were very excited as usual to share in the present-opening. 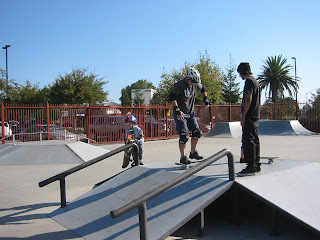 ...and although Nigel accused me of trying to kill him on his birthday he did join in the Skateboard lesson. His new board is very fast! 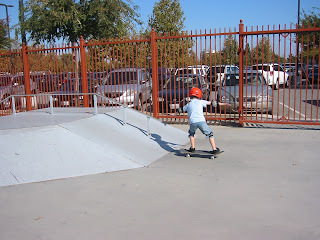 Adam really had a great time at the skate park, he can now do several of the smaller ramps on his own, and both boys tried drop-offs, and skating off a 'table' (dont know what the skate jargon is here...Adam probably does. We wrapped up the birthday celebrations with Carrot cake from Icing on the Cake, and a take-out curry for dinner! Blogging action has been a little light around here recently...but knitting action has been hectic! 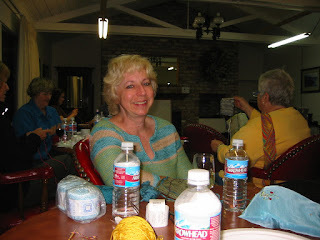 Christina came to LG to visit and knit. 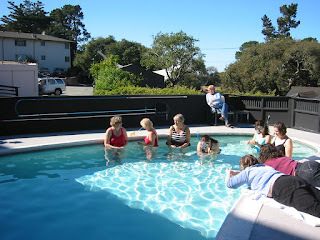 We spent the weekend at the Full Thread Ahead knitting camp in Carmel. (The yarn and needles had to be submerged. 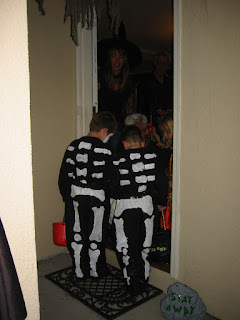 The boys were completely thrilled by the idea of this!). ...and a jolly good time was had by all! Women's hour is a venerable BBC institution and one that I missed very much before I discovered the web streaming version of it. This week they broadcast an interesting item about the publication of This book . 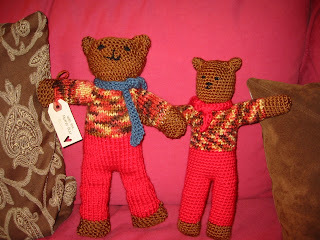 This is 'The Gentle Art of Domesticity" by the woman better known as Yarnstorm . The podcast of the broadcast is available for download from here . I've mentioned this blog before - with her colourful and enticing description of a life spent knitting, quilting, and baking fresh buns for her 3 children's return from school. It's a fantasy life - but an appealing one - for all I know this is actually the author's real life - as much as a blog is ever real. However, what has amazed me is the storm of criticism that the publication of the book seems to have generated, largely accusations of 'anti-feminism' . It is astonishing that even in 2007 women should be called on to defend their choices to work - or not, to knit - or not. To me, the legacy of feminism is that I have the choice to work, be a mother, bake, and knit... if that is what I want to do. The other avenue of criticism against the book is that it is elitist. That because the author has the leisure to spend her time quilting or icing petit four, before collecting her three children from their fee-paying school, it somehow excludes the rest of us without the income to support such a lifestyle. This really amused me because the one thing that you can say about cooking, baking, and knitting, is that they are not typically the pastimes of the rich! What has warmed my heart is that my sentiments seem to be shared by the majority of the Women's Hour listeners who commented on this broadcast, as well as the readers of the Yarnstorm blog....well maybe that last one is not so surprising...but Hurray for Women's Hour! After all, this is really just a knitting/crochet/quilting/baking book (which I have not actually read). 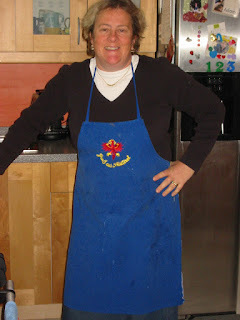 The book has been labelled "pinny pxxx" so, to close, here is a picture of me in my pinny. 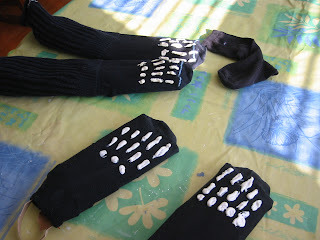 Apart from 'the big project', which is nearing completion, I have been doing a little sock knitting. That is both 'a little knitting' and 'a little sock'. These are short socks for Adam. He requested blue socks, and this wool is leftover from my Charlottes Web shawl. 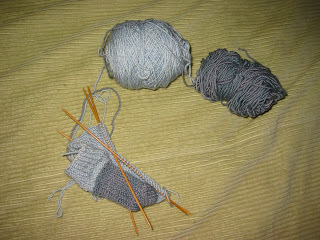 It's koigu so should make nice socks as long as I have enough. I should have knitted them both together to make sure - and may even unpick and reknit them as Adam says they will be too long. His objective is that his socks not show above his shoes. 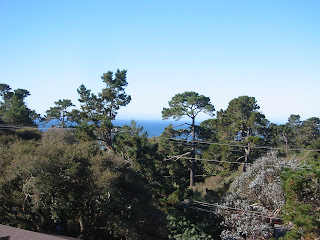 We went to the coastal side of Big Basin State Park to try to Skyline to the Sea trail (although we were headed from the Sea). 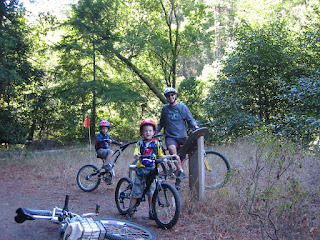 It was a lovely trail, heavily wooded and running alongside Waddell Creek. We didnt get too far up the trail, after a couple of miles the trail became very narrow with steep drop-off to the side so we turned back. 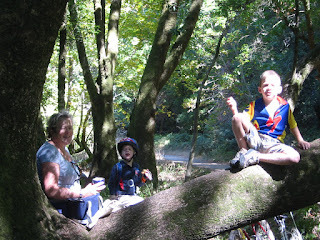 But not before we had a snack in the tree. Tea for us and hot chocolate for the boys. 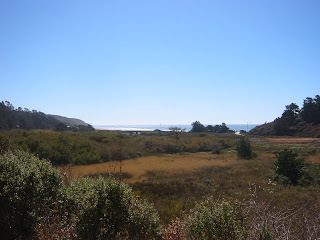 This is the view headed back down the last part of the trail, where Waddell Creek joins the ocean. There is a historical marker showing where some of the missionary priests camped for a few nights in the 18th century, and the boys were most mystified as to why they would camp...their idea of camping of course involves loading the car up with a million and one things! 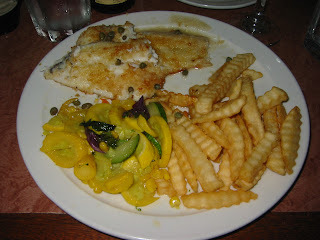 Of course after all the exercise we needed sustenance, so we headed to our favourite wharf restarant: Gilberts. 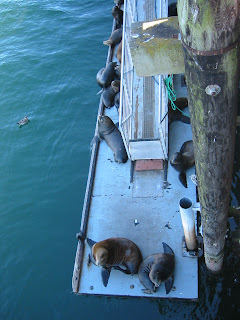 and pointing out to the boys that there was plenty of room on the pontoon for all the sea lions and no need to be fighting over places....we never like to miss a chance! 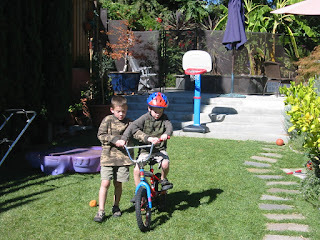 Adam has been trying to teach Finlay how to ride a bike without the training wheels. Finlay does not have Adam's interest in cycling, at the same age Adam was already riding his own bike alongside us - I can see me taking Finlay to high school on the trail-a-bike at this rate! 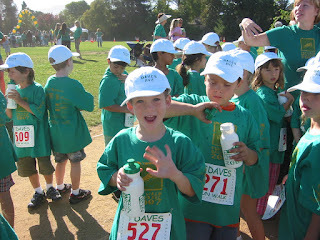 Adam did his fun run today. It was of course a beautiful hot day! 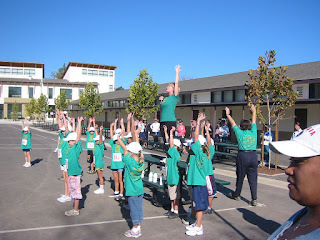 Adam's class teacher started off leading the entire school in a yoga warm-up. and then they were off... 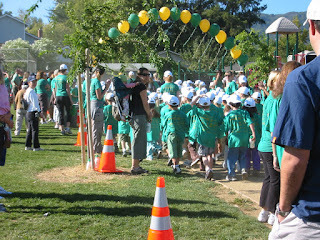 It was quite impressive; they had a DJ to provide rousing music; and 450 children headed off at speed was quite a sight! 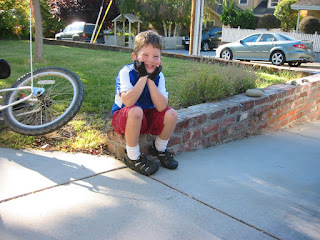 Adam completed 17 laps (laps are 1/3 mile, so just under 6 miles). Thank-you to his sponsors - he walked hard to earn his sponsorship! I saw recently on the BBC that apparently Paddington prefers Marmite . Although I like Marmite as much as the next man (which is Nigel, who likes it quite a lot), I still like a bit of marmalade on my toast. 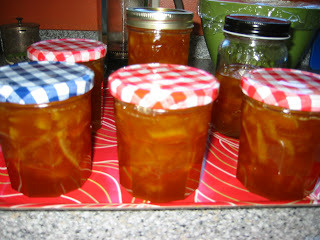 Marmalade seems quite expensive here, and since our neighbour has an orange tree, it makes most sense to make it myself. 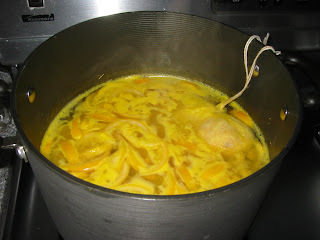 The oranges are quite sour and really inedible raw, but they make great marmalade. The first time around I made it rather runny, but after a second boiling up it seems a nice consistency, and tastes just like the real thing....but more orange-y. I usually pay a 1-jar tariff to my neighbour for the oranges - no idea what he does with the marmalade...maybe he even eats it?